Matt writes: The 21st annual edition of Roger Ebert's Film Festival (a.k.a. Ebertfest), concluded last Saturday, and you can find all the onstage Q&As embedded in our festival coverage. Brian Tallerico covered the opening night screening of "Amazing Grace," while Nick Allen covered the Day 2 panels ("Challenging Stigma Through the Arts" and "Women in Cinema") and screenings ("Coeur Fidele," "Rachel Getting Married" and "Bound," culminating in an unforgettable Q&A with Jennifer Tilly and Gina Gershon). Peter Sobczynski covered Day 3 of the festival ("Sebastian," "Cold War," "Cane River," "A Year of the Quiet Sun" and "Romy and Michele's High School Reunion"), and Nick did the write-up for Day 4 ("Maya Angelou: And Still I Rise," "Won't You Be My Neighbor? ", "Almost Famous" and "Sideways"). The 2018-19 University of Illinois College of Media Roger Ebert Fellows, Curtis Cook, Pari Apostolakos and Eunice Alpasan, also contributed their own dispatches. Below I have embedded the Q&A for "Won't You Be My Neighbor? ", where Nick and I were joined onstage by Chaz Ebert and the film's director, Morgan Neville. At the 16:45 mark, I share the letter that Fred Rogers wrote me when I was five years old. 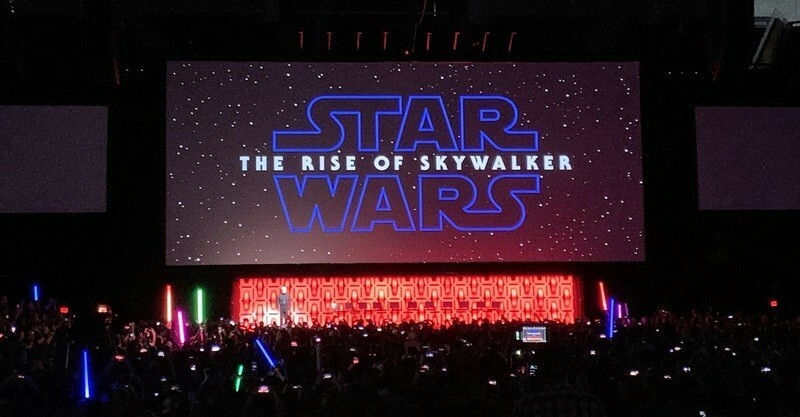 Star Wars: The Rise of Skywalker (2019). Directed by J.J. Abrams. Written by J.J. Abrams, Chris Terrio, Colin Trevorrow and Derek Connolly (based on characters created by George Lucas). Starring Daisy Ridley, Billy Dee Williams, Mark Hamill. Synopsis: The final chapter of the saga from a galaxy far, far away. Opens in US theaters on December 20th, 2019. The Perfection (2019). Directed by Richard Shepard. Written by Richard Shepard, Eric C. Charmelo and Nicole Snyder. Starring Allison Williams, Alaina Huffman, Steven Weber. Synopsis: When troubled musical prodigy Charlotte seeks out Elizabeth, the new star pupil of her former school, the encounter sends both musicians down a sinister path with shocking consequences. Debuts on Netflix on May 24th, 2019. What's My Name: Muhammad Ali (2019). Directed by Antoine Fuqua. Synopsis: One of the most iconic figures in athletic history, Muhammad Ali's incredible story from world champion boxer to inspiring social activist is explored through his own voice and never-before-seen archival material. Premieres on HBO on May 14th, 2019. Wine Country (2019). Directed by Amy Poehler. Written by Liz Cackowski and Emily Spivey. Starring Amy Poehler, Maya Erskine, Maya Rudolph. Synopsis: When a group of longtime girlfriends goes to Napa for the weekend to celebrate their friend's 50th birthday, tensions from the past boil over. Debuts on Netflix on May 10th, 2019. Anna (2019). Written and directed by Luc Besson. Starring Sasha Luss, Helen Mirren, Luke Evans. Synopsis: Beneath Anna Poliatova's striking beauty lies a secret that will unleash her indelible strength and skill to become one of the world's most feared government assassins. Opens in US theaters on June 21st, 2019. The Last Summer (2019). Directed by William Bindley. Written by William Bindley, Scott Bindley and April Prosser. Starring K.J. Apa, Maia Mitchell, Norman Johnson Jr.. Synopsis: A group of young people in Chicago come together during the summer before they head off to college. Debuts on Netflix on May 3rd, 2019. The Professor (2019). Written and directed by Wayne Roberts. Starring Johnny Depp, Zoey Deutch, Justine Warrington. Synopsis: A college professor lives his life with reckless abandon after being diagnosed with a terminal illness. Opens in US theaters on May 17th, 2019. Pavarotti (2019). Directed by Ron Howard. Synopsis: A look at the life and work of opera legend Luciano Pavarotti. Opens in US theaters on June 7th, 2019. The Addams Family (2019). Directed by Greg Tiernan and Conrad Vernon. Written by Matt Lieberman and Pamela Pettler (based on the comic strip by Charles Addams). Starring Charlize Theron, Oscar Isaac, Elsie Fisher. Synopsis: An animated version of Charles Addams' series of cartoons about a peculiar, ghoulish family. Opens in US theaters on October 11th, 2019. My Son (2019). Directed by Christian Carion. Written by Christian Carion and Laure Irrmann. Starring Guillaume Canet, Mélanie Laurent, Olivier de Benoist. Synopsis: The disappearance of his child sends a man on a dark path to find the truth. Opens in US theaters on May 10th, 2019. Parasite (2019). Written and directed by Joon-ho Bong. Starring Kang-ho Song, Sun-kyun Lee, Yeo-Jeong Cho. Synopsis: All unemployed, Ki-taek's family takes peculiar interest in the Parks for their livelihood until they get entangled in an unexpected incident. US release date is TBA. Homecoming (2019). A film by Beyoncé. Synopsis: This intimate, in-depth look at Beyoncé's celebrated 2018 Coachella performance reveals the emotional road from creative concept to cultural movement. Debuts on Netflix on April 17th, 2019. Trial By Fire (2019). Directed by Edward Zwick. Written by Geoffrey Fletcher (based on the New Yorker article by David Grann). Starring Laura Dern, Jack O'Connell, Emily Meade. Synopsis: The tragic and controversial story of Cameron Todd Willingham, who was executed in Texas for killing his three children after scientific evidence and expert testimony that bolstered his claims of innocence were suppressed. Opens in US theaters on May 17th, 2019. Stuber (2019). Directed by Michael Dowse. Written by Tripper Clancy. Starring Kumail Nanjiani, Dave Bautista, Mira Sorvino. Synopsis: A detective recruits his Uber driver into an unexpected night of adventure. Opens in US theaters on July 12th, 2019. J.T. LeRoy (2019). Directed by Justin Kelly. Written by Justin Kelly and Savannah Knoop (based on Knoop's memoir). Starring Kristen Stewart, Laura Dern, Diane Kruger. Synopsis: A young woman named Savannah Knoop spends six years pretending to be the celebrated author JT LeRoy, the made-up literary persona of her sister-in-law. Opens in US theaters on April 26th, 2019. My Spy (2019). Directed by Peter Segal. Written by Erich Hoeber and Jon Hoeber. Starring Dave Bautista, Kristen Schaal, Ken Jeong. Synopsis: A hardened CIA operative finds himself at the mercy of a precocious 9-year-old girl, having been sent undercover to surveil her family. US release date is TBA. Domino (2019). Directed by Brian De Palma. Written by Petter Skavlan. Starring Carice van Houten, Nikolaj Coster-Waldau, Guy Pearce. Synopsis: A Copenhagen police officer seeks justice for his partner's murder by a mysterious man. Opens in US theaters on May 31st, 2019. Joker (2019). Directed by Todd Phillips. Written by Todd Phillips and Scott Silver. Starring Joaquin Phoenix, Zazie Beetz, Robert De Niro. Synopsis: A failed stand-up comedian is driven insane and becomes a psychopathic murderer. Opens in US theaters on October 4th, 2019. Claire Denis on "High Life"
Matt writes: I recently had the opportunity to chat with one of the world's greatest living filmmakers, Claire Denis, about her latest triumph, "High Life," starring Robert Pattinson and Juliette Binoche. We also discussed black holes, child actors, the death penalty and the unmatched landscapes of Africa. Click here for the full conversation. Matt writes: While Ebertfest unfolded in Champaign, Illinois, the 2019 Star Wars Celebration was making headlines in Chicago, and our contributor David Fowlie was there to cover the highlights, including the trailer premiere and title announcement for "Episode IX," as well as a sneak peek of the upcoming series, "The Mandalorian," co-starring Werner Herzog. The Grissom Gang (1971). Directed by Robert Aldrich. Written by Leon Griffiths (based on the novel by James Hadley Chase). Starring Kim Darby, Scott Wilson, Tony Musante. Synopsis: Set in the Depression, a gang of half-witted small-time hoods led by Slim Grissom kidnap heiress Barbara Blandish and Slim proceeds to fall in love with her. The Boxer (1971). Directed by Francesco Prosperi. Written by Lucio Battistrada, Adriano Bolzoni, Armando Crispino and Don Carlos Dunaway. Starring Robert Blake, Catherine Spaak, Ernest Borgnine. Synopsis: Boxer Teddy Wilcox leaves his manager and relocates. He finds Nick, a manager/trainer. Before Wilcox's first fight, Nick receives a threat-- Wilcox loses, or Nick will die. Kiss Shot (1989). Directed by Jerry London. Written by Carl Kleinschmitt. Starring Whoopi Goldberg, Dennis Franz, Tasha Scott. Synopsis: A detached black mother loses her job and also the ability to pay back her credit. She recalls her billiard skills and begins to play for money. Will she be cool enough to be a pro in such a game?